Ganesh Chaturthi is just round the corner and people everywhere are busy preparing for the festivities. Preparing a Prasad of modaks is an integral part of the festivities, as Lord Ganesha loves these sweet dumplings. Given below is a recipe for preparing delicious modaks to please the lord. To start the preparation, you would need the following things. Given below is a step by step method of preparing the modaks. Boil 1¾ cups of water in a deep pan and then use it to knead the flour into soft and smooth dough by adding water and some ghee gradually to the flour. Once the dough prepared, keep it covered at a side for 10 minutes. Take a deep non stick pan and heat the jiggery in it for 1-2 minutes or until it melts, while stirring continuously. Now add grated coconut, poppy seeds and cardamom to the jiggery paste and mix the ingredients well. Cook this mixture on slow flame for 4-5 minutes or till it loses all the moisture and becomes thick. Switch off the gas and leave the mixture to cool for some time. When the mixture has cooled enough, divide it into 21 equal parts and keep aside. Take the dough and divide it also into 21 parts. Taking one part at a time, roll it into a ball first and then flatten it slightly. Give a flowery shape to the edges with the help of the fingers and thumb. Place a spoonful of the mixture in the centre and roll edges so that they taper to the center and seal the filling. Once all the modaks have been thus prepared, steam cook them for 10-15 minutes. Once the modaks are ready, plate them in an attractive manner or according to specific traditions. 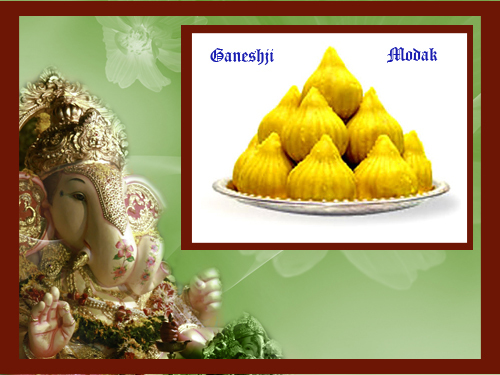 Offer them to Lord Ganesha and seek his blessings for a life full of health, happiness and prosperity!